maggio | 2014 | . ::WoW Skins::. 25-FOR-25 EVENT! RAFAELA SKIN, 99L! 25-FOR-25 PROMO, RAFAELA SKIN ONLY 99L! SALE WILL START AT 12AM 25 MAY AND END 12AM 26 MAY! UPDATE: Thanks a lot for the big success we had at the 25-for-25 event!
. ::WoW Skins::. FLASH WEEKEND SALE 100L! Added WowMeh appliers! Promo WeekEnd this 2 skins at only 100 lindens. 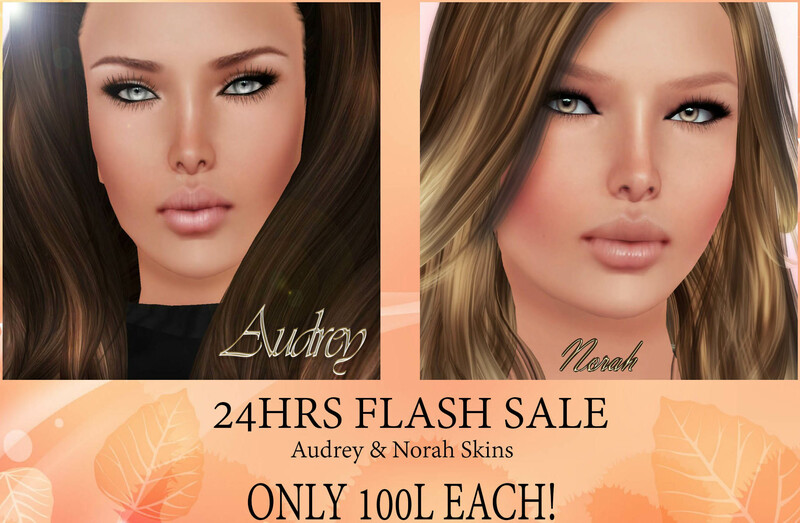 Norah Skin 4 skin tones, pale, tan, bronze,and dark. 1 Natural make up and 5 different make ups. Cleavage option, 3 eyebrow colors, blond, red and dark, eyebrow shaper, freckles option, shape copy and modify, slink hands and feets appliers, lolas mesh breast appliers, phat azz appliers and loud mouth appliers. Of course demo is availble. the 100L sale will end the 26 may! P.S. WowMeh appliers have been added!
. ::WoW Skins::. NEW NANA SKIN FOR DESIGNER CIRCLE EVENT, 99L ONLY! NEW LOCATION, WE ARE MOVING! as some of you know allready, store will move and the new location is ready, the ufflicial opening will be annonced tomorrow with a special surprise, but if you allready want to visit your most then wellcome:) http://maps.secondlife.com/secondlife/Restful%20Pleasure/67/222/26 Also we have 6 small stores for rent, If you know someone that could be interested pls let me know. NEW ANIKA O1 EXCLUSIVE FOR OMG ROOM EVENT! ONLY 100L! Mothers hold their children’s hands for a short while, but their hearts forever. HAPPY MOTHERS DAY EVERYONE! FREE GIFT, Vanessa skin, cleavage option, lolas, phat azz, baby bump, wowmeh, slink appliers included! FREE FOR EVERYONE FOR 24 HOURES!